The hype train that left the station years ago has reached its first stop, and now we finally have access to the Magic Leap One, the device many have claimed would revolutionize the augmented reality space at launch. But is that really true? On Wednesday morning, as Next Reality predicted late Tuesday night, the company took the wraps off its device and opened up orders to the public. Along with the commercial launch (they say it's aimed at developers, but anyone can buy a unit), we were also treated to a group of hands-on reviews of the device by independent users representing seven major media sites picked by Magic Leap for an early demonstration of the final device. Well, so far, the consistent theme seems to be about what I expected: slightly better than the HoloLens, but not a major "leap" ahead of its biggest competitor. Overall, even the most forgiving reviews of the Magic Leap One seem to come across with a general feeling of "Meh, it's okay for a first generation product." The old school Silicon Valley journal seemed to sum things up the best in its quote from Magic Leap CEO Rony Abovitz: "Rony Abovitz realizes that all the hype was a big mistake. 'I think we were arrogant,' he says." Later, the piece points out a challenge for Magic Leap that has plagued several VR companies, namely, making a wearable device that fits everyone. "Magic Leap's experience is so closely linked to a person's physiology, these goggles will need to fit perfectly to work. This is a challenge for a company trying to introduce a new type of tech." Beyond that, there's little in the way of astonished musing regarding the experience. The most enthusiastic praise comes toward the end of the piece, when Wired writes, "I will agree with all the people who have seen Magic Leap and report that the technology paired with the choice of content really are different and better than other things I've seen." "I don't suggest anyone run out to buy one—maybe not for years." Ouch! That stinging (but prudent) suggestion was accompanied on Twitter by a crude animation. 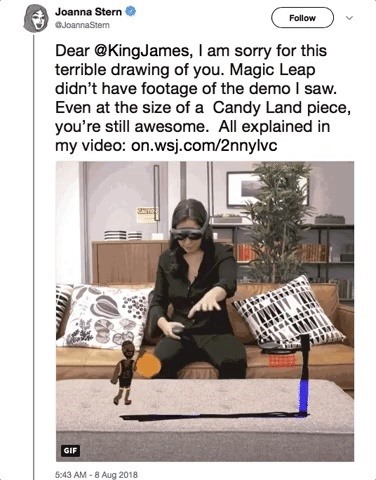 Maybe the animation is just a joke gif — something the reviewer is known and admired for — but I doubt anyone at Magic Leap is laughing. Later, the review deals with the serious business of how the device works. "Some objects appeared cut off unless I turned my head or took a few steps back. Mr. Abovitz says this will be improved in Magic Leap Two." But despite that hopeful note, the most damning critique came when referencing the apps for the Magic Leap One. "I found many of Magic Leap's technically impressive demos to be little more than a novelty." "The Magic Leap One doesn't work if there's too much or too little light in the surrounding environment, but it should be fine in most indoor settings," says CNBC, which would seem to make the device's tetherless portability more of a luxury at this point if using the device outdoors presents viewing problems. I imagine we're years away from the Magic Leap that's ready for the rest of us. "There's also a field-of-vision issue," the review continues. "The Magic Leap One is sort of like looking through a window within your field of view. It doesn't lay the scene on top of everything within your vision, which means it can be hard to see objects that are really close to you or too big for the headset's field of view." However, like the others, the review paints the Magic Leap One as not quite ready for prime time. "I imagine we're years away from the Magic Leap that's ready for the rest of us. One where I don't need my computer or phone at all, where there's no limited on the field of view and where every TV channel and movie and game I want to play is all in that world…"
Unlike some of the other reviews, this one starts off mostly positive. "I think ML One is likely the best AR headset out there right now." But then, soon after, no punches are pulled. "One of AR's great challenges is making faux objects realistically block real ones, and vice versa… The demos I see do this well, mostly… However, when I try crouching behind a chair to see if they will disappear, the robot images sort of bend and come with me, rather than being properly occluded by the furniture." Abovitz says it could take until the fourth generation of the headset to get to a popular gadget you would want to use all the time. In terms of overall experience, the reviewer seemed less than impressed. "I want to feel like those robots are actually coming after me. I want the life-size whale coming out of the gym floor… For this to happen, the hardware will have to get still smaller and better." Later, "There are still some glitches. While the visuals tend to look sharp and stay still when I swiftly shake my head, they sometimes split into red, green, and blue bits as I move around." But perhaps most troubling for anyone (especially developers) thinking of dropping well over $2,000 for the device, is this part of the review: "Abovitz says it could take until the fourth generation of the headset to get to a popular gadget you would want to use all the time." Translation: By the time the Magic Leap device is truly mainstream-ready, say, five to 10 years from now, we may already have our Apple Glasses. The usually mild-mannered CNET put its doubts right in the headline: "I finally tried Magic Leap, and I have mixed feelings." Not long after, the review offered up what appears to be the consensus, "This AR system is a step forward, but not a game changer." Then the comparisons to the HoloLens are raised again. "Microsoft's HoloLens feels like seeing ghosts through a small window in front of your eyes. Magic Leap's One suffers a similar fate. Get close to a virtual car, and the edges start to disappear once they hit the limits of your field of view… Did it wow me? As I said earlier: No, it didn't, really." Rather than publishing a full-fledged review, the gaming insider site posted an incredibly long interview with Abovitz, most of which deals with his oft-expressed vision for the future. But one line — framed before and after with a lot of praise for the device and the company — does stand out: "How it works. I was disappointed. The Magic Leap One headset I messed around with for a few hours last month seems to match up pretty well with what the company was pitching years ago." The harshest critique of the Magic Leap One came from the site that will likely get the most exposure to the company's target audience of mainstream, early tech adopters. "The Magic Leap One's field of view is constantly distracting… Magic Leap has improved on Microsoft's HoloLens in this respect… But it's not nearly enough to look around the world normally. Moderately sized objects were cut off if I got too close, and full-room scenes appeared only in patches." It's not the kind of revolutionary (or downright magical) advance that Magic Leap has teased for years. After hitting the device's field of view, the site went in on the company's apps: "The apps also generally just weren't very novel or interesting. Most were modest riffs on existing HoloLens or phone-based mixed reality experiences… I didn't see the ambitious-sounding projects that Rolling Stone described in a glowing profile last year — like a full-fledged narrative sci-fi scene, a virtual comic book, a theme park experience, and a hyper-realistic virtual woman." "It's still a fascinating, wonderful illusion — maybe the best I've seen in one of these headsets, and far cooler than watching an AR model through an iPhone screen. But it's not the kind of revolutionary (or downright magical) advance that Magic Leap has teased for years. It's a better version of a thing I've tried before, and that thing is still very much a work in progress." Next Reality will have a Magic Leap One in-house soon, after which we'll offer our own take on how the device stacks up to the HoloLens and whether it has a chance to be truly groundbreaking. But for now, among some of the mainstream media, it looks like Magic Leap's launch has already landed with a thud.